Wedding season is upon us and of course, we’re catching up with blogging. 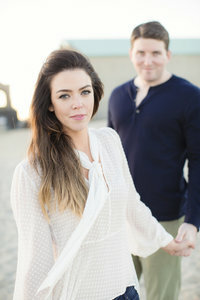 I’d love to share today’s amazing Princeton engagement shoot –Ashley and Michael! These two love birds were adorable in front of the camera! Michael was the perfect hubby-to-be making sure his fiancé was well taken care of the entire session. Despite some cold weather, these two were cozying up to each other the entire time! I especially loved their Bride and Groom fuzzy hats at the end of our session! Read more below to learn about Ashley and Michael’s love story! Mike and I met at a race track in Orange County, New York. It was in October of 2013. He doesn’t believe me, but the first time I saw him I felt butterflies in my stomach. We went on a couple of dates and then ending up officially together the following year in November of 2014. One thing that I am most looking forward to in life-after-marriage is living together and being on our own. We are in the process of renovating a house and my fingers are crossed that it’s all ready by the time we get married. But, I really do look forward to that most… coming home to each other and just being independent together, making our own memories & starting a family. Mike popped the question at my Aunt’s house with my whole family there 2 days before Christmas. We had a scheduled photo shoot for a family photo for my grandparents. We were all dressed nicely and after the big family photos we took a couple of pictures of us together. After our picture he stopped and looked at me and I knew what was coming. It was a beautiful proposal and I was very happy to have my family there. It’s hard to choose a favorite memory that we have together. I asked him to pick one and we both agreed that our first trip to Detroit was one of our favorites. It was the first trip we took just to two of us and we had an amazing time. We went during Christmastime, so the city was decorated so beautifully. There were tree’s up in the city, an ice skating rink, hot chocolate and all the buildings were decorated with lights. We walked around and explored somewhere neither of us had ever been, ate at amazing restaurants and still today we say that if one day we are lucky enough to have a second home or a getaway place we would choose Detroit. We share a love for the downtown city area.. also it helps that Mike is a die hard Detroit Lions fan who has turned me into one as well. What’s one thing that drew you to your significant other? One thing that drew me to Mike (& still does) are his eyes. He’s got such beautiful blue eyes. I feel like when I look into his eyes I can feel the love that we have for each other. It’s really a great feeling. I asked him this question and he said.. When we met you were cold and needed warmth so I tried to help. He offered me his jacket haha!